The term "laser" is an acronym for Light Amplification by the Stimulated Emission of Radiation. The elements necessary for the invention of the first laser have been around for quite some time. Theories of coherence (pertaining to waves with a continuous relationship) and stimulated emission (active discharge) were discussed in detail by Albert Einstein (1879-1955) in 1917, but were presented only as hypotheses (theories). In his writings, Einstein never described a device that could achieve stimulated emission. This was the case until 1954, when American physicist Charles Townes (1915-; 1964 Nobel Prize winner) accomplished stimulated emission using microwaves. With proof that stimulated emission of light was possible, scientists around the world raced to create a working laser. In 1958 Townes and Arthur Schawlow (1921-) delivered a paper that explored the requirements for a laser radiator. At the same time, American physicist Gordon Gould (1920-) designed a working laser model and coined the familiar term. Due to a misunderstanding at the patent office, however, Gould did not apply for a patent (registration) of his design. Townes and Schawlow eventually received the patent, but it was Theodore Harold Maiman (1927-) who received credit for the laser's invention. 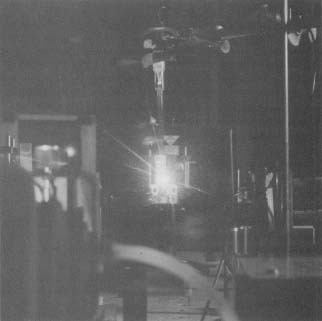 In 1960 Maiman constructed the first working laser in the United States. While F. A. Butayeva and V.A. Fabrikant of the Soviet Union worked on the process at the same time, they did not publish their findings and received almost no credit for their pioneering efforts. Lasers went to work almost as soon as their discovery was announced. Unhampered by distances, early laser beams were directed at the moon and reached within two miles of their planned destination. Lasers, when focused through a lens, were able to cut diamonds with absolute precision. A modern industrial laser. Lasers are also often used for surgery where anesthesia is not required. ruby rod. The flash started a chain reaction that ended with a beam of red light escaping from the rod. This sort of chain reaction is called stimulated emission and is the basis for laser technology. Lasers are used industrially in a wide variety of products. Laser-cut wood products exhibit great precision. Compact discs on which music and electronic data are stored have been made possible by the laser. These discs are capable of saving their information without distortion or fading for long periods of time. 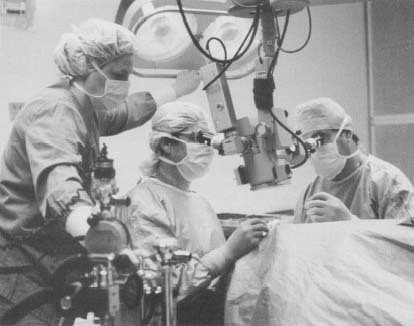 By 1962 efforts at using the laser for medical purposes were under-way. The ruby crystals through which early lasers were transmitted did not lend themselves to medical use. It wasn't until argon (a colorless, oderless intert gas) gas was used in place of the ruby that the correct color and intensity of the laser beam was able to be harnessed for surgery. Laser eye surgery. Lasers are also used to remove birthmarks and wrinkles, reopen blocked arteries, and seal blood vessels to prevent bleeding. Lasers are used regularly for short surgical procedures where no anesthetics are required and for other surgeries where extreme precision is needed. Examples of anesthetic-free surgeries are those of the eye where detached retinas are repaired and cataracts are removed. Lasers are also used to remove birthmarks from the skin, remove wrinkles, reopen blocked arteries, and seal blood vessels to prevent bleeding.